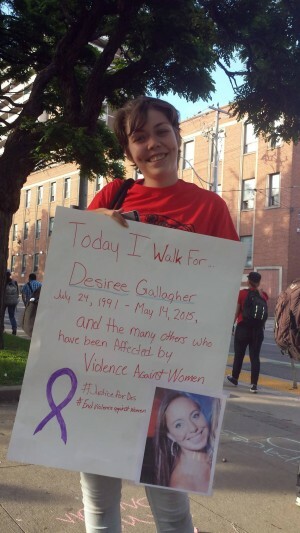 Natalie Wright honouring the memory of Desiree Gallagher. Four days later, a majority of women joined again in solidarity, to march in Toronto’s Downtown East neighbourhood. Reclaim the Streets was about remembering victims of gender-based violence, like Carolyn Connolly, whose 2008 murder inspired the march. It was also a celebration: last year’s march organizers, like the Ontario Coalition Against Poverty, won their demand for 24-hour women and trans drop-in centres. SlutWalk Toronto also walked as a contingent in the Dyke March. This reminded me of last year’s march when I was surprised by the barrage of questions asking me why I participated. They asked me: How does a march accomplish anything? 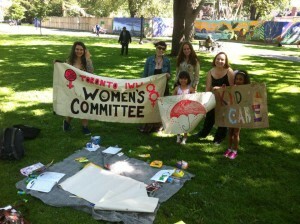 The Toronto IWW’s Women’s Committee providing daycare at Maggie’s rally. 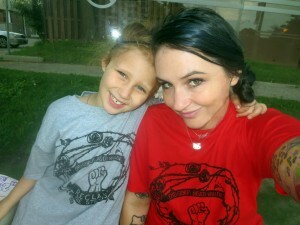 My daughter and I after the march. Building community is very important, and so is taking care of one’s self. Feel-goodism is a superficial, shallow thing; something that requires no sincere effort. Feeling good is different. Sharing joy and taking care of yourself is critical, as the old saying goes, “you can’t take care of others without taking care of yourself.” In a world full of issues and systems that need to be dismantled, it is easy to get tired and down. If something is uplifting and connects like minds, it is just as important as the gritty hard work.